Home Blog Heavenly Perks: Hop on Board The Faithful Traveler’s IndieGoGo Campaign! Trust me. Your rewards will be out of this world. To celebrate the 100th Anniversary of Fatima, The Faithful Traveler is going to Portugal and she wants you to come along! 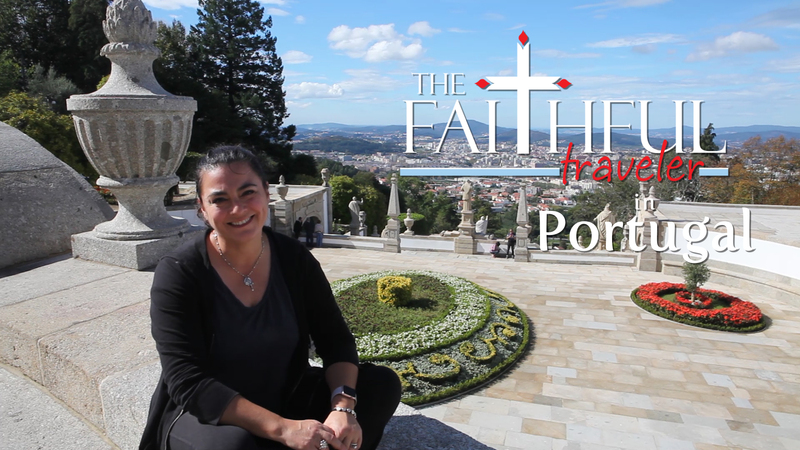 Truth be told, TFT’s Diana von Glahn has already been to Portugal with her husband, David, filming the incredible holy sites there, including Fatima, for their new series, The Faithful Traveler in Portugal. . In fact, TFT will have made three trips to Portugal – necessary to get the excellent footage for the kind of high-caliber productions the von Glahns generate. The footage will be expertly edited and entertainingly narrated so that those who watch will feel as though they’re really there – in Portugal. But, this kind of superb creation is expensive and requires financial backing. The von Glahns provide their series free of charge to Catholic television networks like EWTN, Salt & Light, CatholicTV and Shalom World and pay the production costs out of their own pockets. What they do is a labor of love and they receive no paychecks. The only income comes from DVD sales. The Faithful Traveler team is nearly finished with The Faithful Traveler in Portugal, but they’ve emptied their bank accounts and maxed their credit for this project. If they’re going to complete the series in time for the 100th Anniversary of Fatima in May, they’ll need help. Your help. And mine. The Faithful Traveler has launched an IndieGoGo Campaign to raise the $45,000 they need to finish The Faithful Traveler in Portugal. A number of way-cool perks are being offered in return for your generosity: Free digital downloads, copies of The Mini Book of Saints (by Diana von Glahn), DVDs, and Blu-Rays, photo books, and gifts from Fatima. That, my friends, is an awesome deal! To help promote the cause, I asked Diana von Glahn to do a brief Q&A with me about the series. Here’s what she told me. Q: For many of us, it’s difficult to ask for help. What is it about this project that convinced you to dare a fundraising campaign? A: It’s funny you ask that. The hardest thing for me in producing The Faithful Traveler is asking for help. That’s why I do most everything on the show myself. It’s just easier that way. When you ask for help, you risk being disappointed. Of course, you’re also opening yourself to the possibility of surprise and joy, and you give others the opportunity to be generous and charitable when you ask for help… but it’s the disappointment I usually focus on. Asking for this kind of help is very hard for me. But I think God wants me to humble myself and acknowledge that I simply cannot do this by myself. We cannot produce this series without help from others. What motivated us to reach out with this campaign is the hard fact that we are simply out of money and credit. None of the networks pay for our content, and the only source of income we have from this show is DVD sales, which don’t come close to paying for what it costs to produce this series. While this series was sponsored by many travel-related business-owners in Portugal, there are many other costs associated with producing a television series. Unfortunately, we just can’t pay for this any more. So we either stop producing this series—full stop, right now—or we ask for help. We’re so close to being finished and it’s so good, I hate to just stop. So I’m asking for help. I know that God will motivate those He wants to help us to do so, and He’ll give us what He wants us to have. I’m already humbled with the many generous donations we’ve received so far. It’s like showing someone what you look like without make-up, and they still love you. It hurts and is somewhat shameful, but then you feel better than before, because you realize that there was no need for shame. Q: How is this series different from the others you’ve done? A: Portugal is a wonderful country, devoid of the political and historical strife of the Holy Land, but still foreign for us. It’s a country full of life and Catholic history. It’s got well-known and beloved shrines like Fátima, and less well-known shrines like the Shrine of Sameiro in Braga or the Shrine in Nazaré. It also has a lot of ex-monasteries and convents, that show a different side of the Catholic history of Portugal and its earlier governments. It’s history is fascinating and unlike any we’ve ever seen, and I’m excited to learn and share it. Q: Without spoiling the content for the viewer, what can you say about your experiences in Portugal? A: I could talk about Portugal without stopping for days, I love it so. I never thought I’d go to Portugal—as a Spanish-speaker, the language has always confused me. It sounds like Spanish, but it’s not. But I’ve started learning it since our first trip, and I LOVE it and the people. I hope our series relays my new-found love of this country, it’s people, and its food to the viewer and encourages them to visit it themselves. So many Catholics visit Fátima, which is great, because Fátima is amazing! But then they leave and go to Spain! There’s MORE to see in Portugal! I hope to show them some of the many sacred sites there. St Anthony of Padua and two popes were born there! There is a lot to see. I also hope to show Catholics what it’s like when churches and monasteries become museums. It’s nice that we can still visit them, but what makes them important is lacking—the prayer, the devotion… God. A monastery without monks, a convent without nuns, a church without the Blessed Sacrament—they’re all just buildings. Pretty buildings, historic buildings, yes. But their purpose—to give glory and praise to God—is gone. And that makes me sad. That’s the state of a lot of the sacred sites in Portugal—not all of them, but many. I hope to God that that doesn’t happen everywhere else. Still, Portugal is an amazing country, and there’s much to see. We only scratch the surface, but I hope that what we do cover might encourage travelers to expand their itineraries to include more Portugal than just one little village. For more information about The Faithful Traveler in Portugal IndieGoGo Campaign, click here. Catholic Church, Catholic Television, Fatima, Travel. Bookmark.